Last Saturday we celebrated my Grandmother's birthday. The plan as told to me and as I expected would be for the family to meet at my Grandparents' place sometime after dinner, we would give her her gift, stay for a few hours, and then leave her in peace. It was her birthday after all, why should she have to bother with our mess? But My Grandmother, being my Grandmother, had other ideas and chose instead to run around with platters of cheeses, homemade pizza, and other finger foods. The woman just doesn't stop. We all ate a lot (well I did) and it was topped off by a awesomely rich and chocolatey cake baked by my Aunt, also known as the Cake Decorating Phenom, or as I call her, "Auntie make me look bad." We surprised my Grandmother with a new Kitchen Aid mixer. Her current mixer (and I use that term loosely) is a travesty of justice. When I baked cookies with my Grandmother before Christmas I actually watched her manually spin the bowl after the mixer got bogged down whipping egg whites (yes, I said egg whites). Upon opening her gift we awaited her first comments, my grandmother like most mothers never wants anything for her birthday. There were a few possibilities: The first, "How am I supposed to carry this? "; Second, "this is going to be difficult to clean"; Third, "where am I supposed to put it?." I have actively witnessed my Grandfather fetching ( :) ) the current mixer for my Grandmother, so I didn't bet on the first option, my mother thought otherwise and moved all in (I hear that there was also some betting action on the side between my mother and my aunts, but I'm not sure of the outcome). "It's too heavy, how am I going to carry this?" (Looks like Mom for the win). I tried to explain that she needed a new mixer, her old one just wasn't good anymore. She told me that she takes care of it and it still worked. I assured her that it wasn't that she had given up on the mixer, but rather the mixer had given up on her. So what does any of this have to do with muffins? Nothing really, other than it's an amusing story (to our family at least) and I didn't have an opportunity to bake on Saturday which resulted in baking Sunday morning, requiring something breakfast oriented. I was originally planning on another recipe, but realized that it would require my mixer and I didn't want to risk waking everyone up. I also felt like honey for some reason, did a quick search for Honey Muffins and chose the first one on the list, appropriately titled, Grandma's Honey Muffins. I took a big risk with these muffins deciding not only to mess around the sugar (and adding cinnamon and nutmeg), but also the levening. I had buttermilk on hand and wanted to use up some of that, so to compensate I removed the baking powder entirely and used baking soda. It worked much better than I could have hoped. The muffins rose nice and high with crispy tops, smelled great, and had a not-too-sweet and light flavour. My mother even commented that these were her favourite of any of the muffins I have made (although she seems to be tossing "favourite" around a lot these days :)). I also added a single blackberry to each muffin. Originally I wanted to have them in the centre but I forgot until after I had the batter in the muffin tins. Instead they became more of a garnish :). 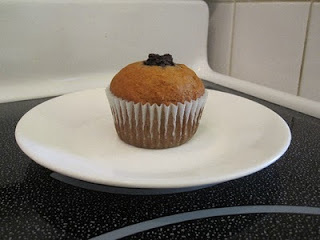 However, the flavour combination was great, the sweet, slightly sour, juiciness of the blackberries contrasting with the light, fluffy, honey flavour of the muffin. Next time I will add more. On a side note: For some reason the bottoms of a few muffins were burned. I would recommend reducing the bake temperature to 375 rather than the 400 from the original recipe. Just for fun I might also try adding more honey or replacing the sugar with honey entirely, giving them an extra honey kick. There is something especially comforting about a warm muffin on a cold snowy Sunday morning, even more so when that muffin is made with honey. But I find it somewhat amusing that after buying my Grandmother a new mixer and then making a stink about it, I went out of my way to avoid using my own. Although, maybe I should drop by her place and see if she's actually using her's. It wouldn't surprise me to find my grandmother in the kitchen, new mixer sitting dejected in the closet, the old mixer out on the counter, my Grandmother frantically spinning the bowl :). 12 blackberries -- or more, or none :). Preheat oven to 375F (my suggestion -- originally 400F) and grease a standard muffin tin or line with muffin wrappers. In a medium bowl add flour, baking soda, cinnamon, salt, and nutmeg and whisk to combine. In a large bowl add milk, sugar, egg, butter, and honey and whisk until completely combined. Add dry ingredients to wet and using a wooden spoon mix until just combined. Evenly distribute batter in prepared muffin tins. If you want blackberries in the center, fill each cup 1/3 full, add blackberries and top with the remaining batter, otherwise press blackberries into the tops of the batter. Allow to cool in pan on rack for 5 minutes before eating. Hahahahaha! Awesome! I can picture it all... Grandma flitting around with the pizzas, Grandpa telling her to sit down... Mom and Co. betting on Grandma's reaction to the gift. Nice to know nothing changes!